You are currently browsing the tag archive for the ‘Breeze Leeds’ tag. Supported by Find Your Talent, Seacroft Manston Children & Young Peoples Partnership, and organised by Space2, the event is a culmination of six months of rehearsals, workshops and creative learning in and around the Seacroft and Manston areas. Three hundred local young people have taken part in the preparations for Expression Arts Festival. Throughout Expression Arts Festival Seacroft Film Factory will film a documentary of the day, hosting a Big Brother style diary room in a garden shed, as well as showing their films in the Seacroft Film Factory cinema . From 7-10pm East Leeds FM will host Next Generation, a live music event where local up and coming band Hope and Social will play alongside some of the best emerging bands from around Leeds. Tickets £3 each available from Jumbo or Crash Records (50p booking fee) or www.elfm.co.uk . No tickets available on the door. Age 11 – 18. 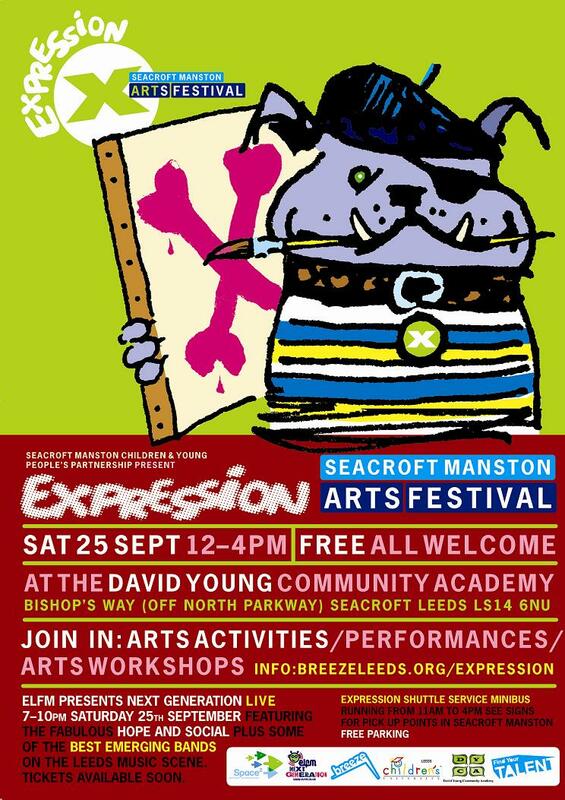 For more information on Expression Arts Festival check out the Breeze Leeds website. Developing the BreezeLeeds website to build on its monthly average of 38,000 hits has been a key focus for the Leeds FYT pathfinder. Over the past six months Rosie Wilks (Breeze Development and Communications Officer) and other members of the Breeze team have been working with a group of young people to help refresh the Breeze brand and develop the Breeze website. The young people taking part have been more than happy to feedback on what they liked and didn’t like and how they thought Breeze should look and feel. Their thoughts and opinions have been taken on board and applied to the new look BreezeLeeds website due to be launched in the next few weeks. The main emphasis of the Young Consultants has been around raising awareness of the Breeze Youth Promise – Leeds’ promise to give young people: something to do; somewhere to go; someone to talk to; and introducing the new element, something to say. The Young Consultants will continue to meet every six weeks to organise other promotional activity which will include running awareness workshops during the Breeze International Youth Festival and Breeze on Tour, and creating school assembly and lesson plans. The latest interesting idea is to give pants (yes, as in underwear) away as a promotional item during the summer…!